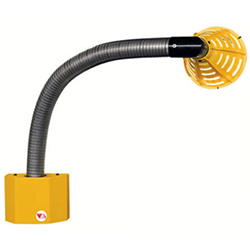 Flexible loading dock work lights have a stainless steel arm that is easily bent to shine light wherever it is necessary, can be rotated 180 degrees and is flexible throughout the entire arm to bend around door tracks and other obstacles. The base is made from powder coated steel for durability with four key slots for easy mounting to any vertical surface. Lights are powered with a six foot power cord or can be hard-wired by removing the EMT knockouts on the back of the base. A heat and impact resistant lamp head that remains cool to the touch protects the LED light module. LED light modules use less power and are brighter than incandescent bulbs, resulting in higher visibility and lower operating costs.